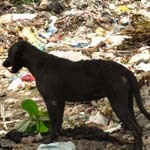 Around half a million stray dogs roam the streets of Sri Lanka, with approximately 3,600 people treated for rabies annually, according to recent reports. There were 24 reported deaths last year due to rabies, mostly from the Western Province. And in 80 percent of such situations, the victims were bitten by household dogs. While dogs are identified to be the main carrier of rabies, cats, humans, wild animals and livestock are also among the rabies-infected. The Government currently spends over Rs. 600 million annually to treat rabies patients, while vaccines and serums are made available to the public at all leading state hospitals. The Ministry of Health has declared that the country would eradicate rabies by 2020, mainly by vaccinating dogs in the country and creating awareness among people.